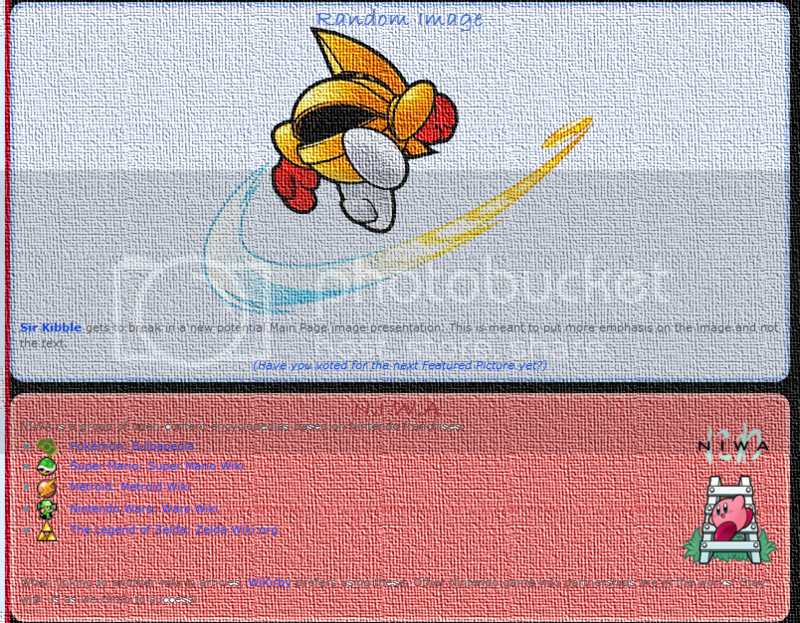 User:Axiomist - WiKirby: it's a wiki, about Kirby! Somebody's mad at IE's stubborn refusal to play nice! This user finds inline redirects to be acceptable. This user is a Mergist. This user says this wiki is Haunted! This user thinks Wikia is the McDonald'sification of wikis. Zelda Wiki.org- most prominent stomping ground of the past- less so now, but they are in good hands. There's still some articles I want to start there but need to WiKirby to a good size and known better to Kirby fans. Wars Wiki- aiming to get some stress free casual wiki editing done there, if time would ever allow :(. Strategy Wiki- started and plan to work on both WiKirby and Strategy Wiki while covering the games in the series. I'm on Canvas Curse now, and have up to Mag Mount written up. Going to be working on Canvas Curse levels mostly. But my top priority will be the task of helping our buddy wiki, Wars Wiki get a great main page going. I'll still be checking on things here and keeping WiKirby open in a tab, constantly refreshed to deal with anything urgent. To answer why I plan to help another wiki with a core aspect of their site; Wars Wiki is now a NIWA member, and I think it's important to keep the alliance strong. If any member wiki needs help on anything I have even a little experience with, I'll do whatever I can to assist. some may fit into multiple types, like Burning is fire and contact. this is meant to be worked on and brainstormed by anyone willing. Ok, work is slowing down a bit in the next few days. I'm going to be back in here soon. I've played a lot of K&tAM on the long trips to and from work. It's not 100% completed, but I think I'll focus on that game until everything possible has an article for it going, however small. After that I'll be hitting up Canvas Curse. Thanks to everyone that helped keep an eye on WiKirby while I was away! These are a higher priority to help WiKirby gets the members needed to grow. ZW needs something to link to. An idea for a Main Page restyling I figure this could work well if done correctly. Feel free to send opinions. This page was last edited on 17 March 2012, at 08:04.